Employees and users alike are shifting from print media to digital. With this transformation comes new ways to reach out to customers. However, within your organization there is probably no longer a need for paper and it could be seen as wasteful. 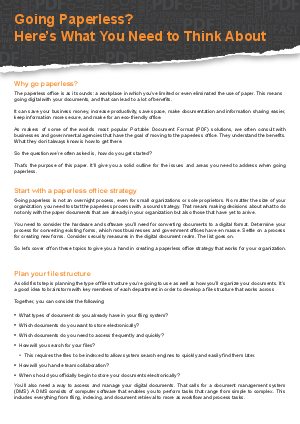 Download this whitepaper to find out why your organization should start thinking about going paperless and see how it will save your business money, increase productivity, and make information sharing easier.